Climate change is at present one of the largest challenges that we, humankind, are facing and must address in order to prevent irreversible changes from happening in the not so distant future and save people and the planet. Towns and cities, with a great concentration of people, are particularly prone to negative impact of climate change. Currently 74% of people in the EU live in towns and cities, in Poland 60% of the population live in urban areas. We need urgent action in order to adapt urban areas to global climate change. It is estimated that climate change will continue, which will result in substantial challenges for towns and cities. Intensifying extreme weather phenomena will include, above all, heat waves, floods, droughts and hurricanes which will be increasingly stronger and more frequent. 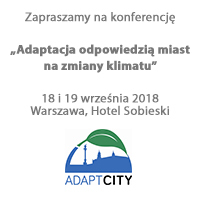 The project’s overall objective is to reduce negative impact of climate change on the ecosystem of the city of Warsaw and to encourage adaptation measures in other metropolises in Poland. raising awareness of climate change and adaptation to it among municipal authorities and encouraging them to become involved in initiatives on the EU level.